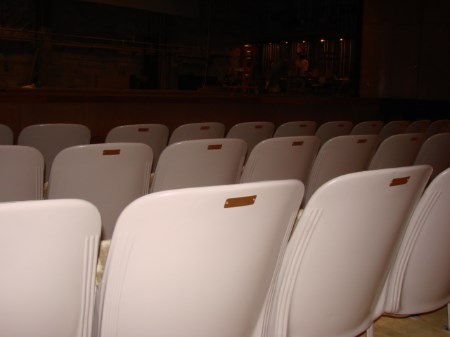 The Friends’ "Chair Campaign" initially raised funds to refurbish auditorium seating – a project that included sandblasting, powder coating, reupholstering and reinstalling over 730 seats in the Bowlus' main auditorium. This project was completed in 2000 at a cost of just over $97,000. To raise the needed funds, the Friends “sold” seats to donors, whose inscriptions were engraved on a brass plaque affixed to the back of the seat. Many donations were given in honor of or in memory of a special friend or loved one, and were sometimes associated with memorials designated to the Friends of the Bowlus. Donors will often ask to purchase tickets for “their” seats when coming to see a show at the Bowlus! While the campaign to refurbish the auditorium seating has ended, chair plaques are still available for a donation of $500, with the funds going to support other current projects. There are 461 seats in the orchestra level of the Bowlus Auditorium. As of the spring of 2015, 335 seats have plaques and 126 remain available. The balcony level has 273 seats, all of which are available.